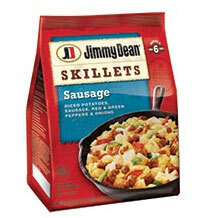 Start your day with a delicious gluten free Breakfast Skillet Sausage by Jimmy Dean. This yummy breakfast includes sausage, potatoes, peppers and onions. To complete the meal just add eggs. Diced potatoes (potatoes, partially hydrogenated vegetable oil [soybean and/or cottonseed oils] and/or vegetable oil [canola, soybean, and/or sunflower oils], maltodextrin, salt, dextrose, tetrasodium pyrophosphate and disodium dihydrogen pyrophosphate (to maintain natural color)), cooked pork sausage (pork, water, contains 2% or less of: salt , sugar, spices, natural flavor (with maltodextrin, succinic acid) sodium phosphates, caramel color), red bell peppers, onion, green bell peppers.